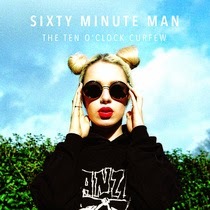 The Ten O'Clock Curfew is the debut EP by Manchester six-piece Sixty Minute Man. It's a record that's not afraid to puff out its chest and make its presence known, doffing its cap to a series of influences whilst retaining its own personality. It's a bold statement of who they are and where they're from. Bang ushers in the record with one. A big keyboard opening drops down into the song's calling card backing vocal harmonies before Daz takes centre stage. In the tradition of so many of their hometown's great vocalists, he's open, honest and heartfelt in his delivery, he means every word of every song on here and that's the record as a whole's great selling point. Sixty Minute Man talk to you, if you live in the city you'll know exactly what they're singing about. The guitars are in your face, but not confrontational - they're not going to blow you away with experimentation, but they're going to impress you with the depth and breadth of power and emotion that they generate. Matchstick Town opens with guitar riff that might be Marmite to some, but it's a precursor to the big chorus of "living in a matchstick town where everything just looks the same", a tale of the repetitive nature of living in suburban Manchester (and possibly a nod to Lowry's painting of matchstick men although the sentiments could relate to any big town or city). Next up is Weightlessness, a track we previewed earlier in the year and the most radio-friendly accessible track on the EP, resplendent with a beautiful rolling keyboard motif and Daz drawing breath and letting go in the chorus. It's got big bold expansive ideas without losing the plot, leaving us to imagine this being belted out in big concert halls at the end of the night. The guitars are back in charge, accompanied by a strident drumbeat, in The Warning's Calling. It's another song with big ideas behind it, a monolithic structure around which they hang guitar riffs whilst Daz proclaims "I put my faith in Jesus, but he wasn't listening." The EP closes with Silver Sun, a song that dismisses any lingering notion that they might have too much tendency to go for the big bombastic sound a little too often. It's got a beautiful meandering guitar hook which runs throughout, giving Daz more space to breathe in his vocal and allowing him to display a softer, more expressive side to his range before the band take over in the middle eight and carry the listener to the end as the chorus comes back in. The Ten O'Clock Curfew is an impressive debut EP, focusing on the strengths of the band, drawing on the influences and legacy of their hometown, but putting their own twist and personality on it and hinting at bigger and better things to come. Sixty Minute Men are Daz Beesley on vocals, Lee Dyson and Sean Duffy on guitars, Dan Hamnett on bass, Scott Beesley on drums and Adam Lyons on keyboards. They are on Facebook, Twitter and Soundcloud.